With a shortened road season and loads of time on the TT bike I decided to target the district time trial championship. The event was meant to happen in Esparto but the location became Athlone just south of Merced. Not a fan of last minute changes and vague course description but this played into my favor as I still had college friends from UCM and that was an opportunity for me to be in town. Pre riding a course isn’t something I’ve done before, makes perfect sense when the course has obstacles which can decide critical selections but less-so on a flat ITT. I had the chance to pre ride the course twice to get very familiar with the straight out and back 18.6mile. The road surface was really good and didn’t require you to look up the road much. The wind direction confirmed my race day pacing strategy, a lot like the last race I did (Tempus Fungit) I’ll try to capitalize time on the outbound and hold on to what I could on the return leg. Equipment wise, I’ll be racing a different front wheel and I wanted to really focus on keeping my head low. Thinking of how things went at Tempus Fungit I wanted to have more than enough time to prepare. Got pinned up and jumped on the trainer to get the legs spinning. Stepped off with loads of time to put on the race wheels and roll to the start (having a start line noticeably away from the registration had me nervous). Off I went as the first p1/2/3 rider, power and position was looking good. It was going to be hard and it felt hard, I got a bit thrown off when I saw the turn around sign a lot sooner than expected (later realized it was for the shorter course). The end of the out-leg just dragged on as I was waiting for it to just come to an end! At the very end of the road I got to turn around and I was happy with the effort I had just done. Rolled quite a bit below power at the beginning which was a really nice relief. Felt that I could bump up the effort. Focused more on my position and speed and less so on the effort I was rolling back fast. 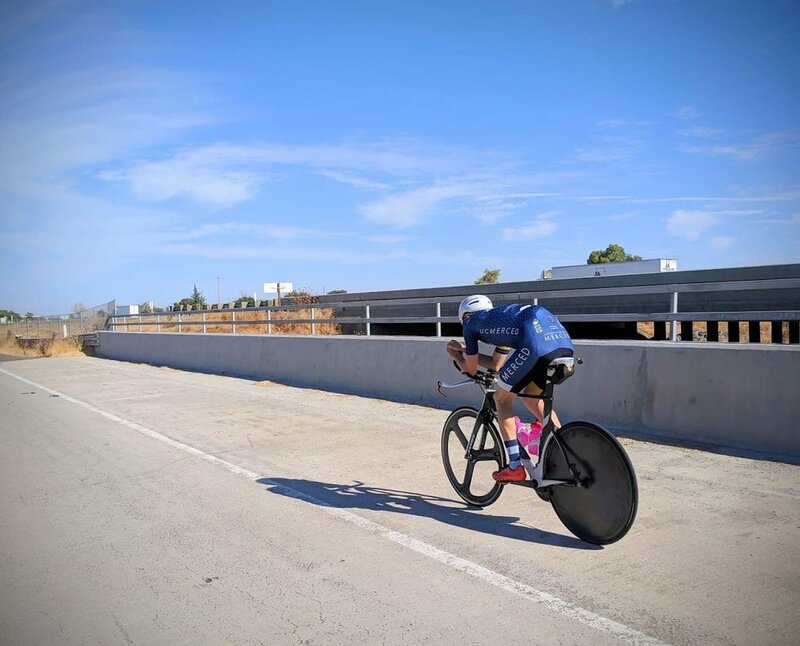 Figured I’d push a slightly uncomfortable pace until the LeGrand highway ramp and dump whatever I had left to the finish (finish line was right under an overpass so you could see it from far away). Picking up more speed, I decided that now was the time to give it all I had. Noticed a “2mile” sign, then the “1mile” came. I could see the finish but was also noticing a freight train coming towards me (course was between the hw99 and some train tracks, wasn’t as dodgy as it sounds but without any trees you’d feel the train go by). That train became the extra motivation I needed to “make it home” before the train would blown me around and wreck my focus. Got to the line right before it, felt good about what I just did, essentially performed well on the out-leg and finished fast (last 3miles above 31mph). It felt like an amazing ride (TT’s aren’t usually described as fun), that was the fastest I’ve ridden a bike alone, got to stay on top of my big chairing and justified all the otherwise silly aero equipment. I was happy but knew that some big names were in my category and that my absolute power output was on the lower half of the field. Talking to my teammate who just finished we had similar times, figured I did all I could but this course favored raw power. The official times came out and had me in third place behind now district champion Robert Skinner and proven time trialist Kevin Metcalfe! What a good way to end a good ride, a perfect spot that rewards my TT focus yet leaves me hungry for next year! I’d like to thank VeloPromo for making this race happen, I understand that bike racing has been shaky grounds and glad that a relocation was able to save the event.